also create smaller areas of hypoxia in the shallower coastal waters that can impact oysters. The Croatian Pride pushes off the dock and cuts slowly through the grey Gulf of Mexico, its engine growling. The air hangs thick and steamy, and the movement of the 40-foot oyster boat brings relief as it breezes past marshy areas where blue herons stand sentinel. The boat’s captain, John Tesvich, is a fourth generation oysterman, but on this early fall day, it’s journalists, not oysters, that he’s hauling. an oyster marketable on board the Croatian Pride. 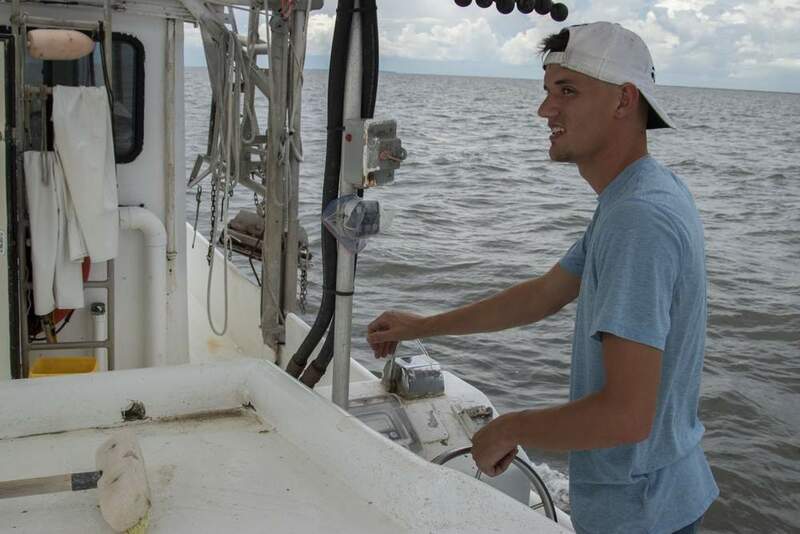 Reporters are on board the Croatian Pride to learn about Louisiana’s $50 billion plan to restore the state’s rapidly vanishing coastline, a crisis the New York Times Magazine termed “existential,” and the impact those plans will have on Louisiana’s legendary oyster fishery. 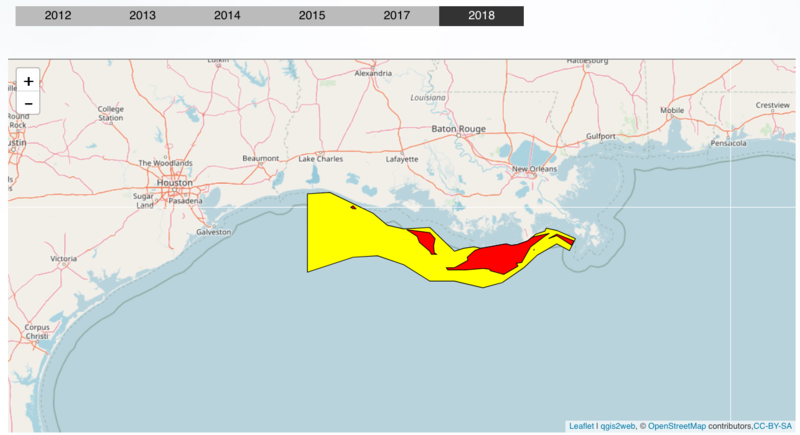 The discussion jumps, however, from coastal restoration, to the lingering impacts of the Deep Water Horizon spill, to Hurricane Katrina, and finally the Gulf’s “dead zone,” a huge swath of ocean the size of Connecticut that forms every summer and is essentially devoid of life. Coastal Louisiana faces a complex web of environmental challenges from land loss, to declining fisheries, water quality problems and climate change. On the Croatian Pride this September day, the stepchild issue is water quality, or more specifically the nutrient-laden agricultural fertilizer and wastewater that wash into the Gulf and boost algae and microbe blooms that gobble up oxygen and kill other marine life—while creating the second largest dead zone in the world. 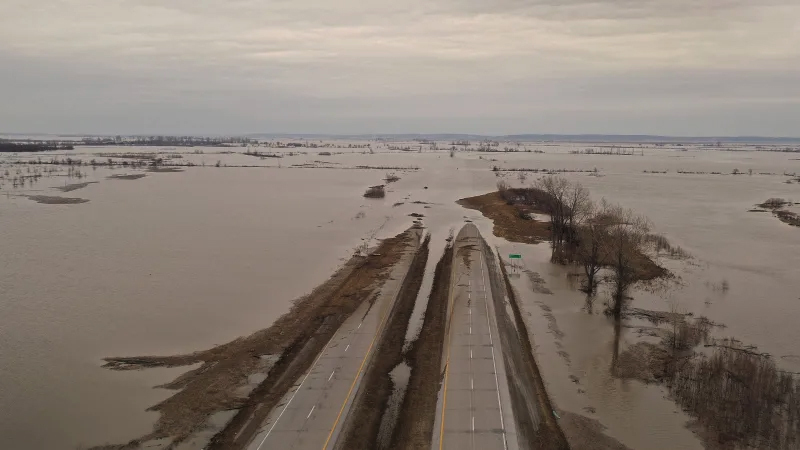 Nitrogen run-off from the nation’s booming Corn Belt is the single largest source of nutrient pollution in the Mississippi River basin, which drains a stunning 41 percent of the waterways in the contiguous United States. 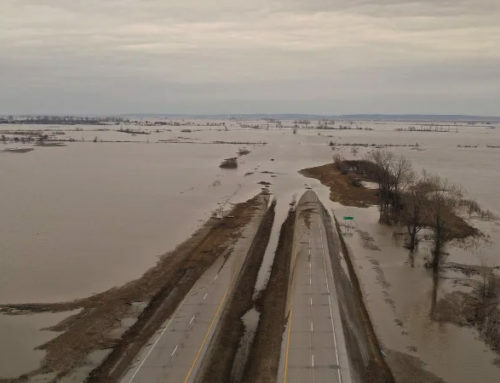 Massive amounts of water, sediment and nutrients wash off cornfields from as far away as Minnesota, enter the Mississippi River system, and eventually reach the Gulf. The problem may worsen if the Environmental Protection Agency (EPA) raises the ethanol mandate for blended gasoline next month—despite earlier commitments to reduce it. Fully one-third of corn grown in the U.S. already goes to ethanol refiners today, and that number could climb. The Gulf of Mexico’s dead zone forms far offshore, but even oysters are not immune to the low-oxygen condition, called hypoxia, that agricultural wastes can create. Shrimp boat, Empire Louisiana. Shrimp are one of the commercial species most harmed by nutrient pollution originating from farming in the Mississippi River basin. 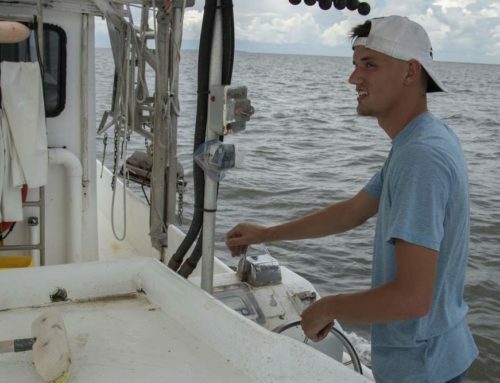 The Gulf’s shrimp fishery has been on the decline for a variety of reasons. Thirty years ago, 90 percent of the shrimp consumed in the U.S. originated in the Gulf. Today it’s just 30 percent. The rest is imported. The commercial fisheries hit hardest by the dead zone are shrimp and fish such as red snapper. The biggest impact is loss of productive habitat. 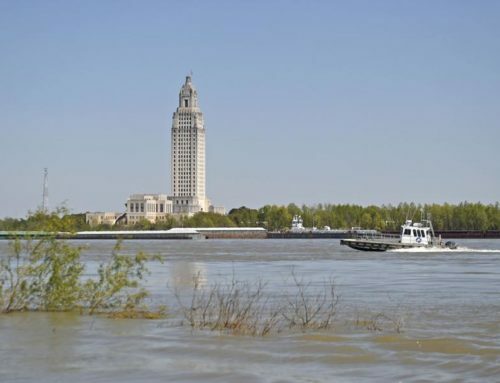 Shrimp fishermen are also forced to go further out, spend more on diesel fuel, and the shrimp they catch tend to be smaller, says Nancy Rabalais, executive director and professor, Louisiana Universities Marine Consortium. 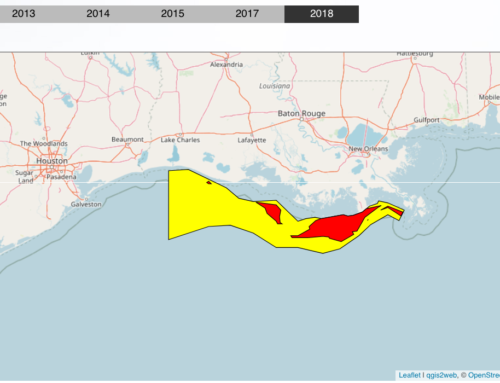 The dead zone is one of many reasons why the Gulf’s valuable fishing industry, generating close to $2 billion in sales in Louisiana alone, is diminishing. Thirty years ago, 90 percent of the shrimp consumed in the U.S. originated in the Gulf. Today it’s just 30 percent. The oyster fishery is also struggling in the wake of the 2010 Deepwater Horizon oil spill and subsequent freshwater flooding events from the Mississippi River, which are toxic to oysters. 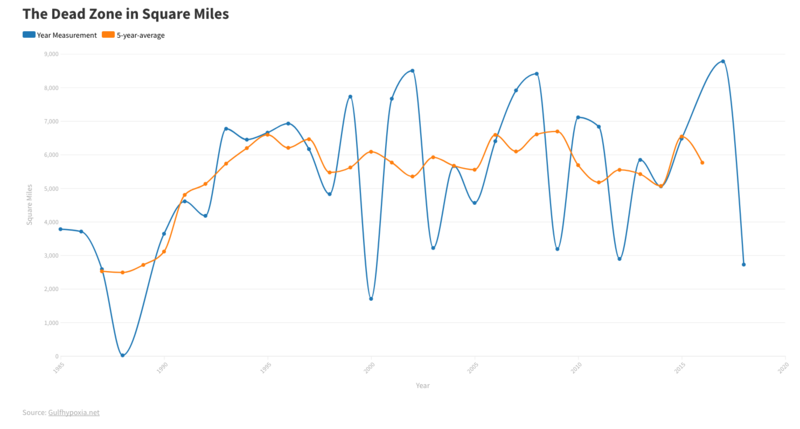 Last year was the worst on record, according to Tesvich, who says, “I can’t tell if I’ll have oysters next week or in a month,” and that he’s had to source oysters from Maryland on occasion to keep up with orders. While Tesvich speaks, his nephew Luke Cibilich steers the Croatian Pride through a thicket of white poles that jut from the water like a slalom course, marking bed ownership. Dropping a backhoe-like shovel into the water, Cibilich hauls up a couple dozen oysters mixed with rocks and mud and dumps the load onto a counter. Tesvich sorts through the craggy, blackened shells and slices them open to offer his guests. “Oysters are at their weakest in the summer, after they’ve spawned,” he explains. 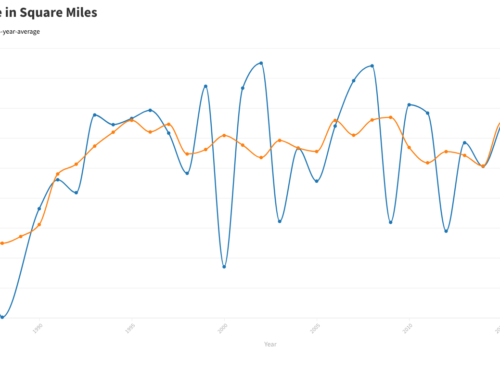 “Temperatures are high.” That’s precisely when hypoxic conditions hit, whether inshore or further out in the dead zone. Various strategies are being pursued for reducing the nutrient pollution in the Mississippi River basin, which is largely unregulated. A lawsuit is pending against the EPA. Petitioners want the agency to set enforceable, numeric limits on nitrogen and phosphorus that would force upstream states to curb the pollution. Better farm management practices, such as more precise application of fertilizers, reduced tillage, broader use of cover crops, and the development of buffer strips and wetlands to act as natural filters, are the most cost-effective means of control, as outlined in Ceres’ recent report,Water & Climate Risks Facing U.S. Corn Production. But getting corn farmers and other growers to voluntarily change their practices isn’t easy. That’s where large corn buyers can come in, and increasingly they are. Walmart, the country’s largest grocer, is collaborating with its food and beverage suppliers and their supply chains to reduce the fertilizer impacts of 14 million acres of U.S. farmland. Companies like General Mills, and Coca-Cola have begun partnering with grain suppliers, agronomic experts and farmers to measure fertilizer use and identify opportunities for improvement. But more companies – including ethanol producers – need to step up. Meg Wilcox rejoined Ceres as a senior manager of Communications in January 2014, after a two-year hiatus at Root Capital. Meg first began working for Ceres’ communications team in 2008. She handles media relations and external communications projects, focusing especially on BICEP communications and climate and energy policy.